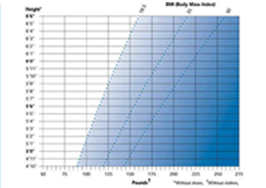 We are pleased to provide a Body Mass Index (BMI) Calculator. Use this calculator for adults, 20 years and older. To calculate body mass for children and teens, 2 to 19 years old, please visit: cdc.com; a trusted affiliate. BMI is a number calculated from a person's weight and height. BMI provides a reliable indicator of body fatness for most people and is used to screen for weight categories that may lead to health problems. Enter your height and your weight to see your current Body Mass Index.